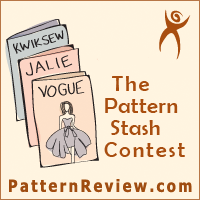 I'm participating in Pattern Review's Pattern Stash contest right now, so I'll be sharing a lot of my makes in the next while. I've gone through the vast stash of unmade patterns and pulled out a few that are both relatively easy and which I have some need of. The first few items I've finished are all knit tops. I really don't like plain t-shirts very much, but I've found a lack of quick and comfy tops in my wardrobe. For this project I am trying to use up as much of my stash fabric as possible, so I pulled out 2 patterns and matched them up with two lengths of black knit that were left over from other projects. 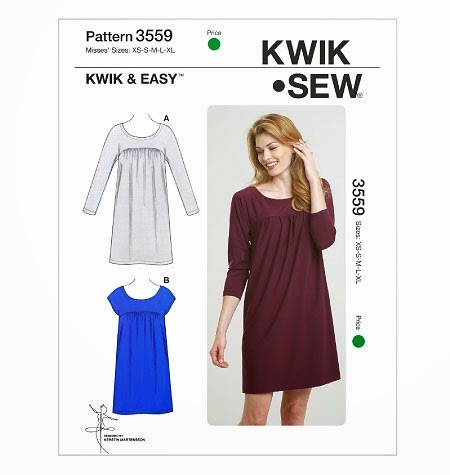 The first pattern is Kwik Sew 3559. This is actually a dress but I cut it off to tunic length, both because I had just enough fabric for that and because I really wanted this style of top rather than another dress. I really, really love it. much this thin knit doesn't approve of the iron. The back is straight, no gathers. It falls nicely. The only alteration I made on this one, besides shortening it, was to grade from medium at shoulders and bust to large at hip, despite Kwik Sew's regular stern admonition not to grade between sizes. Oh, and I did not use the neckline facings as I didn't think that this very light fabric would look great with facings. I just turned under the neckline. I'm glad I made this one first because it was easy and successful, and a top that I know I'm going to love. Next up was Simplicity 2181. I had grand visions of this one, even if I was making it out of a thicker plain black instead of a thin and shiny print. It was a bit of a slog, in the sense that the construction had me confused. Probably best not to start a new project instead of heading to bed... but in any case, I got this one done and I do like it. I don't think the sizing is quite right though -- the gathers at the shoulder seams are uneven and cause funny bulky issues. I wonder if that 's because I should have taken some width out of the shoulder. It does make me feel a bit frumpy. Getting the little band through the front openings to form the gathers was an exercise in patience as well, and I'm not convinced by the final effect. But again, it may just be the fabric choice, or the sizing. I think that if I slightly shortened the upper bodice area as well as the shoulder width it would fit better overall. There was a fair bit of gathering to do, and an unusual seam that formed the opening for the little gathering band. I did find the order of sewing the sleeve cuffs on a bit odd -- they're supposed to be sewn on flat, before the side seams, but I thought that would leave an ugly inner sleeve, so sewed up the sides then sewed the cuffs on as a band. But the good thing is when I tried it on tonight I did like it better than last night upon finishing. So perhaps it'll grow on me! Anyhow, the next couple of planned projects are not basic black -- they are quite bright, in contrast! But I know I'll get a lot of wear out of these black basic tees. 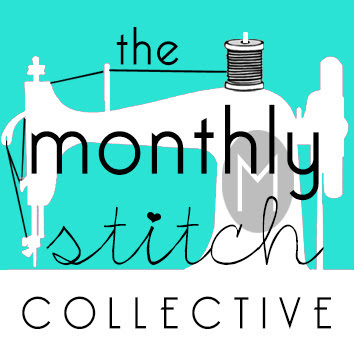 Especially the Kwik Sew! Two great additions to your wardrobe I particularly like the first version what a good idea to use a dress pattern. 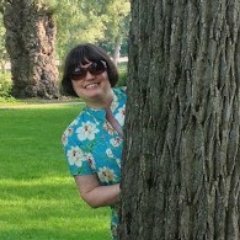 I really liked the yoke of this dress pattern, and knew it would make a great tunic too! Seriously- black tops are like dachshunds- you can't have too many- they are all fab.